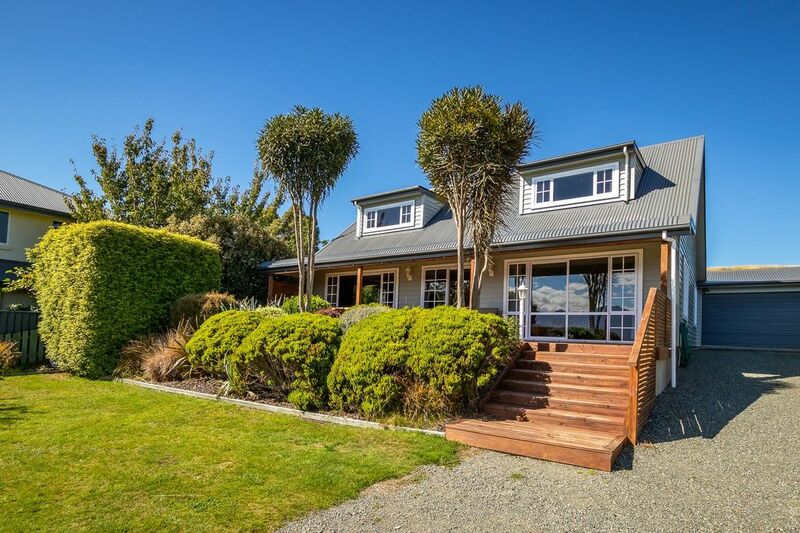 This immaculate five star home situated with direct panoramic views to the pristine, legendary Lake Manapouri and Fiordland National Park mountain ranges, is an ideal base for your perfect home away from home luxury holiday. A fully fence yard with a native garden and grassed lawn offers a safe outdoor area for the younger guests. Outdoor furniture on the sheltered front deck gives a tranquil space for peaceful contemplation of the stunning vista. Plenty of off road parking for boats and vehicles. Indoors the open plan living-dining has all quality furnishings, SKY tv, dvd, wifi and a fully appointed kitchen with everything required to cook and bake to your hearts content. A large dining table with seating for six for comfortable family gatherings. The sliding doors take full opportunity of views to the lake and mountains. Three bedrooms downstairs, two with stunning views to the lake and mountain ranges. All bedrooms have wardrobes, bedside tables and lights, opening windows and high spec beds and bedding. The downstairs double and King bedrooms have glorious views - that, in addition to the fresh extreme comfort of new beds and quality bedding, make it quite tricky to want to get out and start the day! The third bedroom is a single twin. There is an option of a fourth bedroom upstairs, with a King bed, if your group combination so requires a fourth bedroom (Please let me know before your arrival if you require this additional room so it can be opened). There is a children's movie/toy/play room with a sliding door out to the back garden. Off this room is the laundry - supertub, washing machine and dryer. There is a second bathroom with a shower and toilet off the laundry. The main bathroom has a vanity, shower and bathtub. All fresh high quality bedroom, bathroom and kitchen linen is provided - laundered at the home between guests. We very much welcome you to come and enjoy this fabulous home. Credit Card details are required as security for the home. A secure site is emailed to you. A non refundable deposit required to secure booking. Kia Ora and Welcome to Lakefront Villa. I am a long time Manapouri local, happily working within Fiordland tourism, for my years in the area, in roles such as hosting on the now decommissioned 99 year old vessel Tawera, taking freedom walkers and stores across Lake Te Anau to the beginning of the Milford Track. I am familiar with the Fiordland Gems Doubtful Sound and Milford Sound - spending many evenings at both Sounds- and am more than happy to recommend cruises and activities that will fit best with your group's needs. Lakefront Villa is tended to a high standard with all linen laundered at the home. Lakefront Villa is a real home, happily shared so you may truly relax and make Manapouri your base for the duration of your Fiordland adventure. May you enjoy this super home. Manapouri is a peaceful, beautiful village set on the shores of Lake Manapouri and the Waiau River. Everything is within walking distance, including the Doubtful Sound departure point. Doubtful Sound departure point rural township welcoming guests. Manapouri is a friendly, beautiful village on the shores of Lake Manapouri and the Waiau River. A truly stunning spot. Waiau River - full of canny trout. Million dollar view no matter the weather. Follow the track across the road directly to the beach and lake. Fiordland National Park supreme panoramic mountain views. Heat Pump - Nightstore - Oil heaters - Log fire with winter fuel supplied. All fresh linen laundered at Lakefront. Full kitchen - plenty for cooking and baking. 5 Pushbikes available for use. Helmets and locks. All information in folder at house. We enjoyed our stay in the home. Clean and well maintained, with everything thing we needed in the home. The group was three couples and everyone picked a bedroom they wanted, with one spare unused bedroom with twin beds. The two bathrooms worked well for getting everyone showered in morning, and were accessible without bothering anyone's bedroom. They had turned some heat on before we arrived so the main living area was comfortable when we arrived. We enjoyed the sunsets out on the deck each evening, walked into town for dinner at the Church and down to the harbor. The area across the road from the house is beach and park, and the road is not noisy as the day ends. It worked great for our home base to explore Doubtful Sound and Milford Sound. Would rent again! We wish we could give this property 10 stars. The was was one of the best vacations we've ever rented. Tastefully decorated, well appointed, beautiful layout, lots of extras and a thoughtful hostess. Highly recommend. We had the best stay. The house is spacious with the perfect set up for our family of 4 (we didn't even use the big bedroom upstairs): it has 3 bedrooms downstairs right near each other, 2 of them with queen beds and great views of the lake, an open kitchen plan (kitchen had everything you needed, very new and nice) into a large sitting room, and there's a playroom in the back with a big box of legos (much to my children's delight). There is a beautiful front deck with a nice big table and a very nice BBQ grill for outdoor meals. There is also a nice grass lawn in front that my kids played on (and you can close the gate to make it safe from the road). It's a 5 minutes drive to the dock where all the boats leave for the Doubtful Sound tours (which we did and would highly recommend). You can also walk across the street in front of the house and through a little footpath for about 5 minutes and get to Fraser's Beach, a nice beach on the edge of Lake Manapouri for swimming. One thing I'll note is that there is no grocery store in "town." There's a cafe that has a few items you can buy like eggs, milk, and bread and such, but do your shopping before you arrive (the closest big grocery store is 18min away in Te Anu). This house was a gem and we hope to be back some day! Thank you for the use of your so lovely house on the lakefront. It was comfortable and a great relaxing location. We arrived in the evening to a warmed house thanks to our thoughtful host. This house ticked all our boxes. Clean, warm, modetn comfortable home away from home. A fabulous kitchen well laid out and everything you need. This house has great flow, is peaceful and close to coffee or 20 mins to Te Anau if you are looking for a supermarket. I hope to be back again one day. Happy to offer local advice on trips and tours for Doubtful Sound and Milford Sound.